Pep Guardiola has defended his "extraordinary, exceptional" Manchester City team and challenged them to forget last week's bitter setbacks and produce a historic comeback against Liverpool tonight. City trail Liverpool 3-0 going into the second leg of their Champions League quarter-final at the Etihad Stadium and Guardiola acknowledged they will have to be "almost perfect" to become only the third side in the competition's history, after Deportivo La Coruna and Barcelona, to overturn at least a three-goal deficit in the knockout round. Their preparations suffered another blow on Saturday when Manchester United staged a dramatic fightback from two goals down at the Etihad to win the derby 3-2 and stop City from sealing the Premier League title with six matches to go. But Guardiola says he has seen enough fireworks from his team this season to convince him that they are capable of producing one of the great fightbacks and provide further proof that they can become a European heavyweight. "I think to reach the semi-final would be only the second time in our history," he said. "We don't need to talk much about motivation. The way they play in every game all season shows what they want to do. "My team is extraordinary, not many others are comparable to it, it's top - exceptional. I will be close to them no matter what happens between now and the end of the season. It's a joy to be manager of them. "Of course to go through you have to make almost the perfect game, create chances, be clinical, concede few chances, defend well. All the conditions have to be perfect. "But what we've shown this year, even in the last game (against United), is we can create a lot of chances in a few minutes. "We know that and the opponents know that." 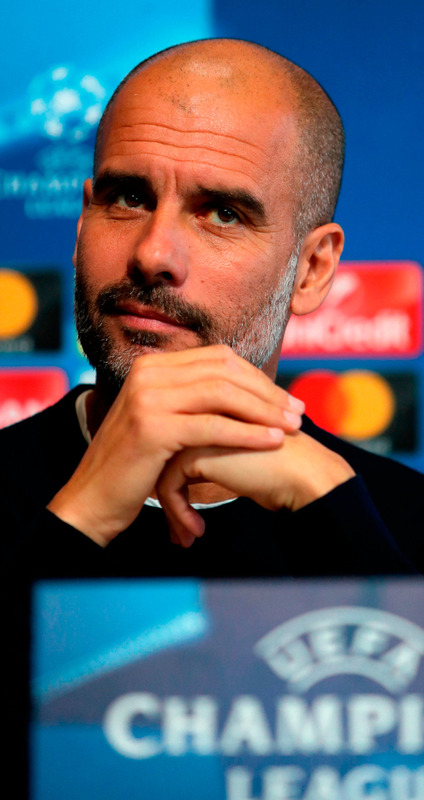 Guardiola has talked frequently since taking charge at City in June 2016 about how the club lacks the European pedigree of rivals such as Real Madrid, Barcelona, Bayern Munich, United and, indeed, Liverpool, who are targeting a sixth European Cup. But the Catalan believes an extraordinary turnaround against Jurgen Klopp's side would help to accelerate the process of correcting that shortcoming. "That's true, I think they (the players) know it. I agree. We need titles in Europe. It's so complicated (to achieve) but you need nights that make people understand it. Beating Barcelona (3-1 last season) was so special because we know they're the best team in the world and to beat them creates that (mentality). "What this club has done in the last 10 years, in terms of creating amazing facilities and making it bigger, sooner or later it will happen. "For the big clubs you need a lot of time but hopefully we can do it, maybe next year or maybe the next one, but sooner it will happen. "This team is ready to fight with all the teams in Europe, I am pretty sure, but the mountain you have to climb is high. "It's difficult but we can compete, especially at home. "For the next step, maybe we need more time but we did better than last season and my feeling now is next season we will be better again." Fernandinho believes it is imperative that he and City's other senior players, such as Vincent Kompany, David Silva and Sergio Aguero, lead by example against Liverpool. "Now is the time for all the experienced players to take over, to take charge and stay in front of the group and keep the spirits high," the Brazil midfielder said. "We have to be together, everyone at the club, to make some amazing scenes. "The fans might want a thrashing but we know it is going to be difficult. The most important thing will be the first action and the first goal and after that see what happens." Fernandinho also stressed the importance of City keeping a clean sheet, which might be easier said than done given the onus on them to attack and Liverpool's threat on the counter. City have kept just three clean sheets in their past 13 home games in all competitions, while Liverpool have scored 37 goals in 11 Champions League matches this term. Liverpool scored three times in a 19-minute burst in the first leg, and United three times in 16 second-half minutes on Saturday, and Guardiola said he "has an idea what to do" about that. Despite Nicolas Otamendi's struggles in the two games, though, the manager suggested he would keep faith with the Argentina centre-half. "He's not just got huge quality but also a huge mentality," Guardiola said. "We are here in the quarter-finals and 13 points clear in the Premier League and Otamendi was one of the important reasons why."